The idea of a Civilian Police Review Board has been touted as a solution to police brutality for the past 50 years. With 200 CCRBs in existence across the country, the idea is gaining traction. But will police unions allow the communities they serve to investigate it and to subpoena officers? The city of Newark, N.J., a city with such bad police-brutality issues that the U.S. Department of Justice investigated it, wants to find out, but the city’s Fraternal Order of Police, along with its Superior Officers Association, prefers its power unchecked. Now the city is in New Jersey State Superior Court, preparing to fight an injunction issued Wednesday against its police Civilian Complaint Review Board by the FOP. It’s a state-versus-local tussle: Does a New Jersey municipality have the right to investigate and subpoena the police, powers that normally are functions of the state legislature? The FOP and the SOA are questioning the legal authority of the city to use these powers against them. What’s really at stake is whether black and brown communities in Newark have the right to use this legal remedy to stop police brutality. 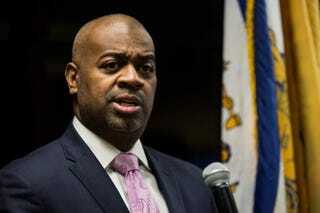 Newark Mayor Ras Baraka did not talk to local media Thursday about the case—one that has, as of this writing, shut down the city’s CCRB. But he did talk to The Root briefly in his office Thursday night, saying that there’s no longer any middle ground between the FOP and the city. The city will file a response in state Superior Court on Jan. 6, he said. Baraka said that what Newark is trying to do is unique. In addition to the disputed powers, the CCRB also has a "punishment matrix" for officers. If the police director does not follow through on the recommended punishment because he thinks the board decided in error, he must explain his actions to the board, a body that will have regular public hearings. The mayor’s comments to The Root, made after an emergency Newark City Hall meeting with the CCRB’s commissioners Thursday night, came after an early-afternoon press conference by some of the city’s most prominent civil rights leadership: the city chapter of the NAACP, the People’s Organization for Progress and the Newark Anti-Violence Coalition. Between the three of them, those three respective representatives—NAACP Newark-chapter President Deborah Smith-Gregory, POP Chairman Lawrence Hamm (who called the press conference) and Zayid Muhammad—have been activists in the city for nearly five decades. Lawrence Hamm, chairperson of the People's Organization for Progress (center), holds a press conference at Newark, N.J. City Hall on Dec. 15, 2016, reacting to news that the city's Fraternal Order of Police and Superior Officers Association had gained a state Superior Court injunction against the city's police Civilian Complaint Review Board. Also at the press conference are, from left, CCRB Chair Rick Robinson, Newark Anti-Violence Coalition representative Zayid Muhammad, radical journalist-activist Dave Hungerford and Newark NAACP leader Deborah Smith-Gregory. Literally standing together in City Hall with CCRB Chair Rick Robinson, who Hamm said was unable to speak because of the injunction, they decried the FOP’s action and said that without those two powers, the board would be toothless. The board is a local manifestation—and Baraka’s interpretation—of the consent decree of the U.S. Department of Justice’s harsh 2014 report on police brutality in Newark. The FOP told NJ Advance Media, a local media outlet, that the CCRB is not a mandatory part of the federal consent decree that resulted from the report. This is an issue not only of police reform but also of democracy, a concept with which Newark has always had an interesting relationship. Like Detroit and a few other urban enclaves, it has been dubbed a “black power” city because it took the black power movement and tried to turn that movement’s radical goals into public policy. Democracy, back then, did not belong to white America alone—it was seized by black and brown communities, who defiantly painted it whatever color they wanted, and attempted to define it on their own decolonized terms. The press conference participants were once the young student activists of Newark, young Turks of the civil rights and black power movements. They wanted a new democracy: a “new ark,” as the mayor's father, Amiri Baraka Sr., the late activist-playwright and the city’s honorary black radical founding father, used to call it. They decided that Newark was their village, so they took out shovels and dug themselves in. They stayed. Their optimism didn't waver when disco replaced soul, crack cocaine replaced weed and the revolution wasn't in vogue anymore. They still want on board that "new ark,” and they are not swayed by the fickle attention spans of people who could never love this city the way they do. Whether Newark goes through cycles of being shaded as the armpit of America, then as the next great comeback kid and back again, does not shift their course. These activists are in it for the long haul and will continue to fight every single day. That’s a historically consistent Newark sentiment. But for now, it’s going to be a state Superior Court judge who will determine what legal “people power” the city’s residents will have with and over its Police Department.